Here's one of our most popular posts from the archives. If you are a new gardener or gardening in a new spot, it's well worth it to get your soil tested to ensure happy plants and bountiful harvests. I've always thought that getting your soil tested was going to be somehow difficult and arcane. But I've had some challenges growing things since moving here (namely like a non-blooming hydrangea). So since Julie said it's a good idea, I've decided to give it a try. I visited the UVM Extension Service website. And downloaded this form to fill out. And scooped some dirt into a bag. It's best to take samples from multiple places, digging in the first 6" of soil, mix up the various handfuls of soilin a bucket, and select your soil test sample from this mixture. It gives the soil test people a better idea of the overall make-up of your soil. Make sure the bucket and spade are very, very clean. Tomorrow I'll send the dirt and $18 to UVM. And in 10 - 14 days I'll get back a recommendation of what I should add to my soil to grow what what we're planning. In the meantime, I'm watching as the plants blossom, and unfurl, and grow. The last day of last year's inedible sorrel. Tomorrow I'm ripping it out to make room for the currant bushes when they come, and will throw the leaves into a Greek-flavored braise I'm making. 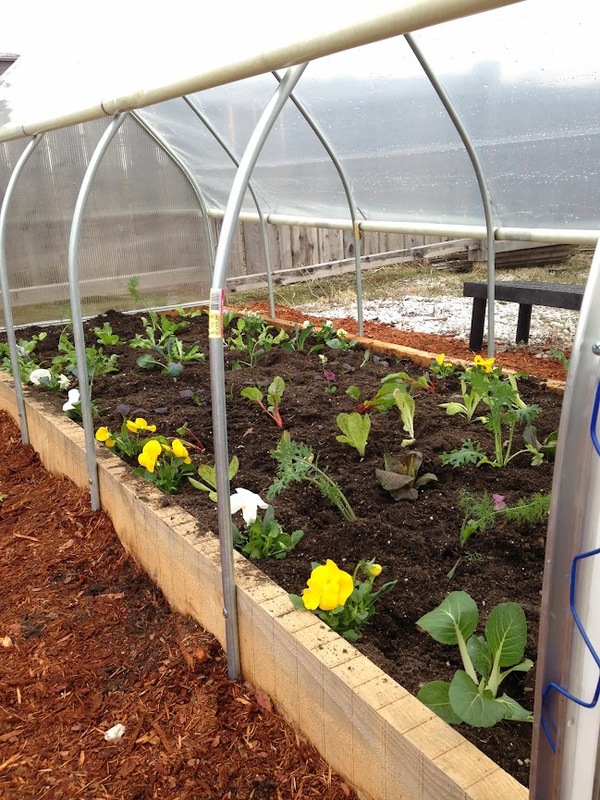 Look at these great greenhouses Eric Denice has built. We are offering four of them for sale this spring. And can deliver them to you, too. We have used the same materials that go into our production greenhouses...6 mil plastic, hoops bent at just the right angle to shed water and snow, polycarbonate end walls, wiggle wire and extruded metal track for securing the plastic closed, and pipes that act as a "brake" for keeping the sides just where you want them. We are happy to give you a demo....or come and peek at ours that is all planted and growing along nicely. 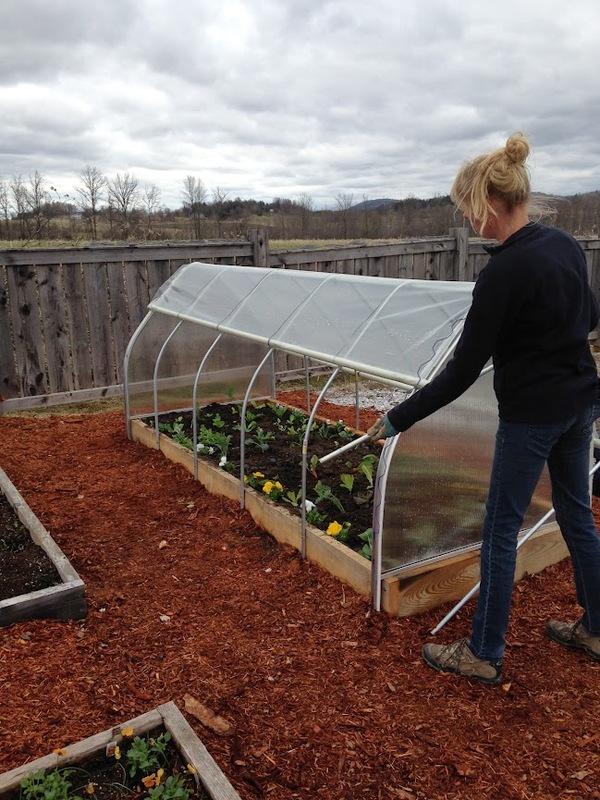 You can roll up the sides, you can close it securely and easily, or even take the plastic all the way off once the weather warms up. The frame can act as part of a trellis system for tomatoes giving them a warm and dry environment as they size up, and then you can take the plastic all the way off and let them grow through the top of the frame. Just add a few horizontal lines of twine and, voila, instant tomato trellis! Plants are nicely tucked in and cozy warm, no matter what the weather! You can easily get a 2 to 3 week jump on the season with this kind of season extension. The raised bed means that the soil is dry and warm long before garden beds, and the tight, plastic cover gives you warmth on cold nights. You can keep the sides rolled down on chilly, cloudy days, but it is best to roll them up a bit in the morning. It can get quite warm in there when the sun pops out. 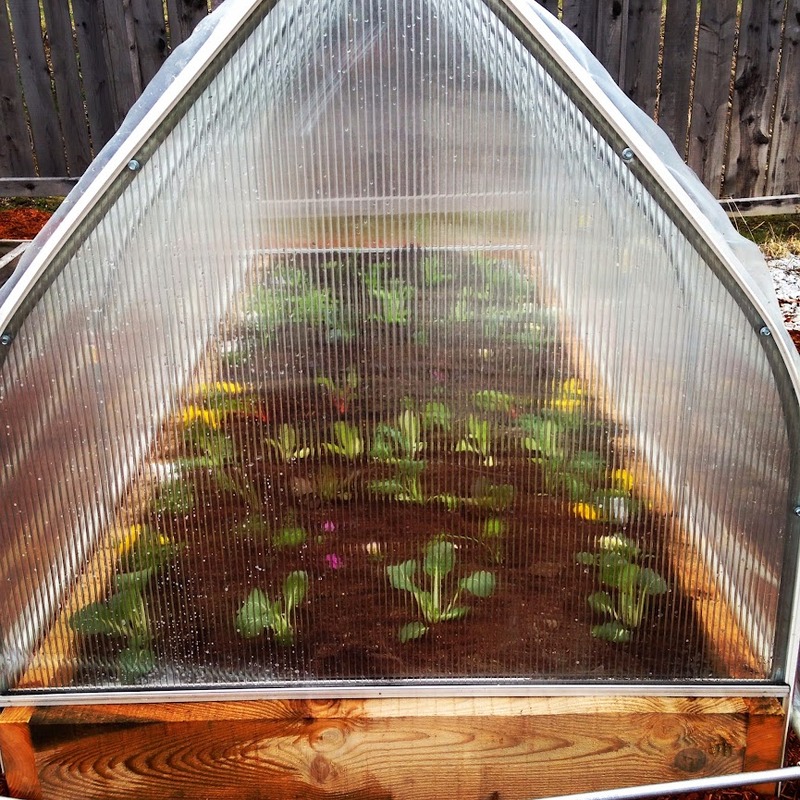 This type of greenhouse will allow you to harvest greens almost year round. 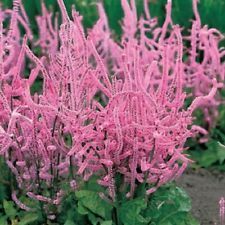 It can also be used as a spot to start seeds, harden off plants, and gives you an extra zone of warmth if you would like to grow a perennial that is not usually hardy here. We can deliver, bring you soil, plants, and have your instant garden ready in just an hour or so! Just add water. This year we will again be offering a weekly share of Gerard’s Bread! 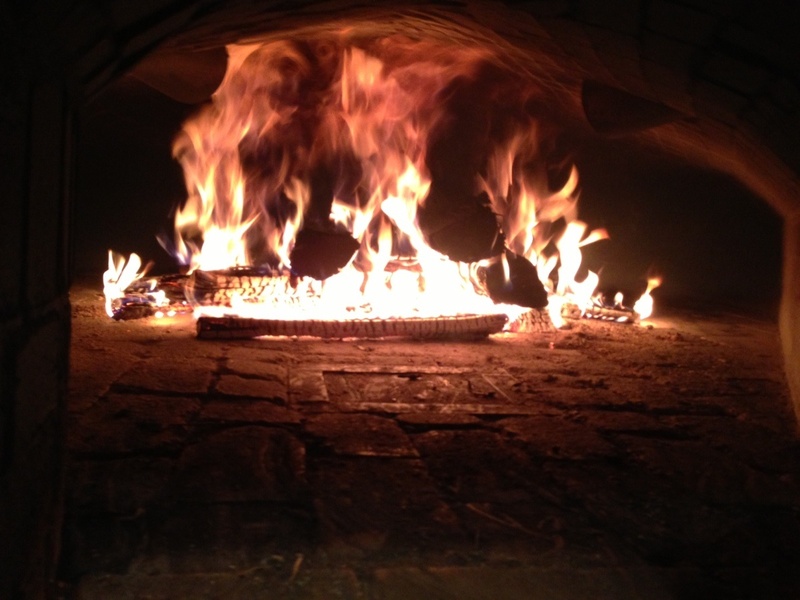 Gerard Rubaud is Julie’s father and bakes wonderful bread in his wood-fired oven. He uses a fermentation method that relies on wild (as opposed to commercial) yeast for leavening. The method, traditional in France, involves culturing grains, flour and water to produces a natural starter called levain. 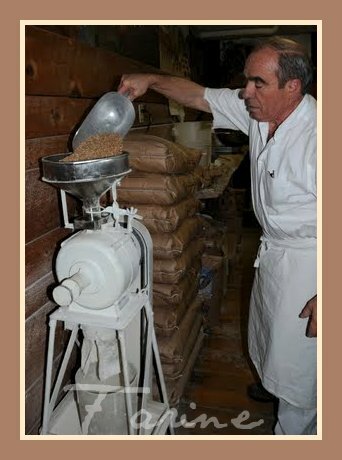 He grinds many of his ingredients from whole grains, including rye, spelt and wheat. About a quarter of his dough is comprised of these freshly ground grains, the remainder is white flour. It is simply delicious! Pickups are on Saturday the bread is usually here at Red Wagon by noon. It costs $84.00 for the share, ($6 per loaf). If you can’t make it on Saturday for pick up we will hold your bread until Sunday evening. Or ask a friend to adopt your loaf! If you are interested, please send us an email (julie@redwagonplants.com) or send a check made out to Red Wagon Plants to 2408 Shelburne Falls Rd Hinesburg, VT 05461. Cost: $100 for the month of April and we guarantee enough salad greens for 4 side salads a week for two salad eaters. That comes to about $3.00 a serving for the freshest greens you can find. 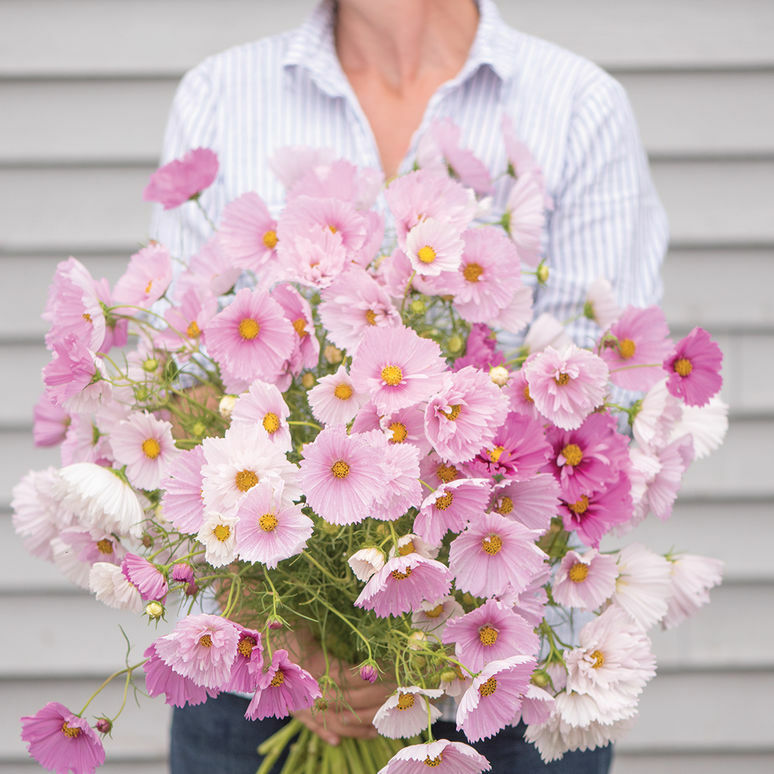 Pick up: at our Hinesburg Greenhouses at 2408 Shelburne Falls Road on Friday afternoons between 3 and 6pm. If you cannot make it then, no problem. Just email us and we will set them aside for you. Bring your pots and trays back to us after you have cut the greens. We will compost the soil and use it in our gardens. The first pick up will be Friday, April 4th and the last pick up will be Friday, April 25th. At home: All you need is room for three trays, about 10" by 20" each. 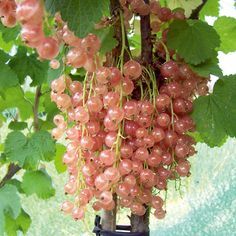 It can be near a window, but that is not absolutely necessary since you will be harvesting them within a week. When you are ready for a salad, just snip the greens at the base with a paring knife or scissors, rinse and dry them, and toss with a very light dressing. We prefer a simple dressing of a good salad oil such as extra-virgin olive oil, hazelnut oil or walnut oil; a squeeze of lemon or splash of sherry vinegar; and a pinch of Maldon sea salt. These greens are so fresh, that you want to be able to really taste them. Keep the bottled dressing for those fridge greens! These are the counter top greens and they deserve top-shelf treatment. Thanks so much. Bring in the bounty! It's the dead of winter and the weather has been...well, let's not even talk about it. The seed catalogs have poured in, they are lying all around the house, tempting us with dreams of future sunshine, dirt under the nails, baskets of produce, and all those things we are deprived of in these short, dark days. Here are a few things I like to do to get through winter. I would love to hear other people's coping strategies, so please share your thoughts on cabin fever gardening. For one thing, meditate. Not necessarily in a formal way, but just sit still. Imagine seeds, roots, and bulbs that are buried deep in the frozen earth. This period of short days is necessary in the life of a plant. It is a time of dormancy and rejuvenation, for plants as well as for humans. Rather than fight the dark days, embrace this as a time of year when you get to slow down, evaluate, and regenerate. I love that, because of my work, my life can follow seasonal rhythms to a certain extent. Winter is when I plan, plot, analyze, and restore. Next, look for signs of green. As the days slowly lengthen, find a special shrub or tree to study on a regular basis. We have a row of willows along the edge of our property, and I love to check out the progress of the softening that happens very slowly, and then after mid-February, it speeds up a bit. The buds begin to swell, the color of the stems changes ever so slowly and slightly. Because plants are our best teachers, we can be the best students of plants with simple observation. Focus on your houseplants. 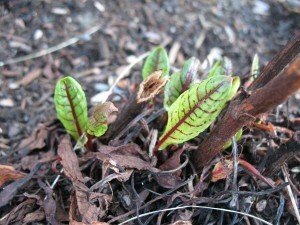 At our house, we neglect these poor plants all summer, but try to baby them a bit in the winter. Careful watering, cleaning, fertilizing as needed, potting into bigger pots, moving them around...these are all tasks we never have time for the rest of the year. You can also try your hand at propagating your own house plants. It is a great way to learn about plant physiology, and it gives you new plants as a bonus. Think holiday gifts for next year! There is a great series of 15 short tutorials on You Tube that will teach you everything you need to know to multiply your houseplants. Ask friends for cuttings from their plants, diversify your own collection and learn about the various ways that all types of plants root. Again, observation is key here, and the lesson learned in plant physiology will transfer to and inform your practical gardening knowledge outdoors. Grow some sprouts. There are great resources locally and on line. Here are some suggestions. Sprout People offers instruction, seeds and supplies. You can also make your own set up pretty cheaply with some window screen and mason jars. High Mowing Seeds has some great options too. Grow some greens and shoots. You'll need a grow light, otherwise, things will be leggy and less nutritious, even in a south facing window. You will also need some trays with drain holes, about 2 inches high, some good potting soil, and some good quality seeds. You can sprinkle seeds onto the surface of the soil, press down, and cover with a very thin layer of soil. Press down again, and water very gently and evenly. Try these crops for a quick 3 weeks to harvest: arugula, tatsoi, mustard greens, boc choi. If you are willing to wait a little longer, in 5 weeks, you can harvest baby lettuce, spinach, kale, chard, cilantro, or dill. The trick here is to stick to varieties that grow quickly. You can only cut them once, the light will just not be strong enough for them to grow again. Here are some instructions for growing pea shoots. You can do this so easily in any kitchen and it is a great way to add some fresh, living foods to your winter diet. Hope this helps, and don't hesitate to get with us on facebook, twitter @redwagonplants, or leave comments here. We really want to hear your winter gardening habits, tricks, trials, and successes. 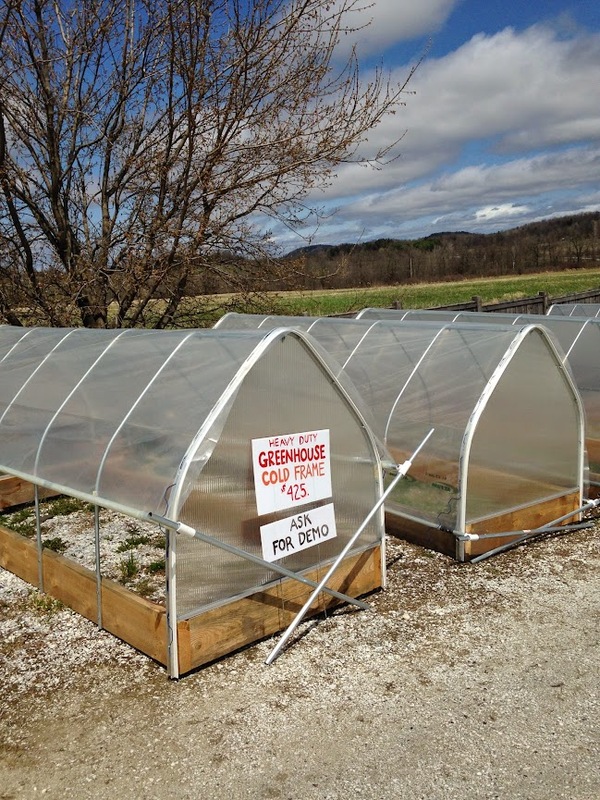 What's a greenhouse grower to do when the spring season winds down and there is still plenty of great weather for summer growing and the greenhouses are empty? Well, start a new business, that is what. 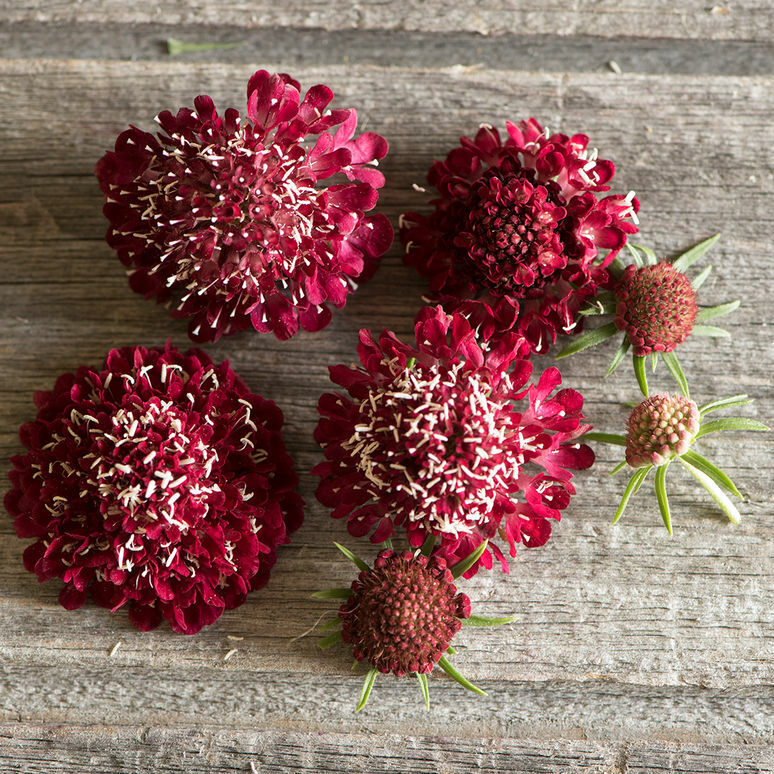 We are so happy to introduce to you our new sister business, Red Wagon Herbs. We are growing Certified Organic herbs for year round harvest and selling to local stores, restaurants, and food hubs. Our focus is on the popular culinary herbs for now, but we are likely to branch out into the more unusual once we have had a chance to explore our markets and have gotten familiar with our new growing practices. This is a perfectly natural extension of our plant business since we already partner with fantastic stores and we love to grow herbs more than anything else. As a matter of fact, the plant business, in its earliest days, was just a potted herb business. In a way, we are going to back to those days and loving the continuity, evolution, and expansion. Our herbs are grown using three different methods: in the ground for summer and fall harvest, in a new, unheated greenhouse (paid for in part by a grant from NRCS EQIP) for fall, winter and spring harvest, and in our existing, heated houses for those coldest months. We are excited to be the only Vermont farm offering organic herbs year round and hope you enjoy cooking with them as much as we enjoy growing them. Please be on the look out for an Open House this fall so we can show you what we have been up to and give you a chance to smell, touch, taste, and see it all. Growing vegetables in your backyard, community garden or in some containers by the kitchen door is a great way to feed yourself -- whether it be just a few ripe tomatoes in August or a full-fledged homesteader's garden, you are on the right path to feeding yourself and your family. Gardening is a great way to improve how you eat while spending some contemplative time outside. With all of these benefits in mind, it is easy to jump into gardening enthusiastically, and you will reap even more rewards with a little bit of planning. In Vermont, our gardening season seems short but can be stretched almost year round with a few simple tips. I always recommend that people take a look at how their vegetable gardens have been in the past and find just one or two things they would like to improve so that they can grow more of it for a longer season. For example a common question I hear is "how can I keep cilantro from bolting?" Well, in short, you can't! 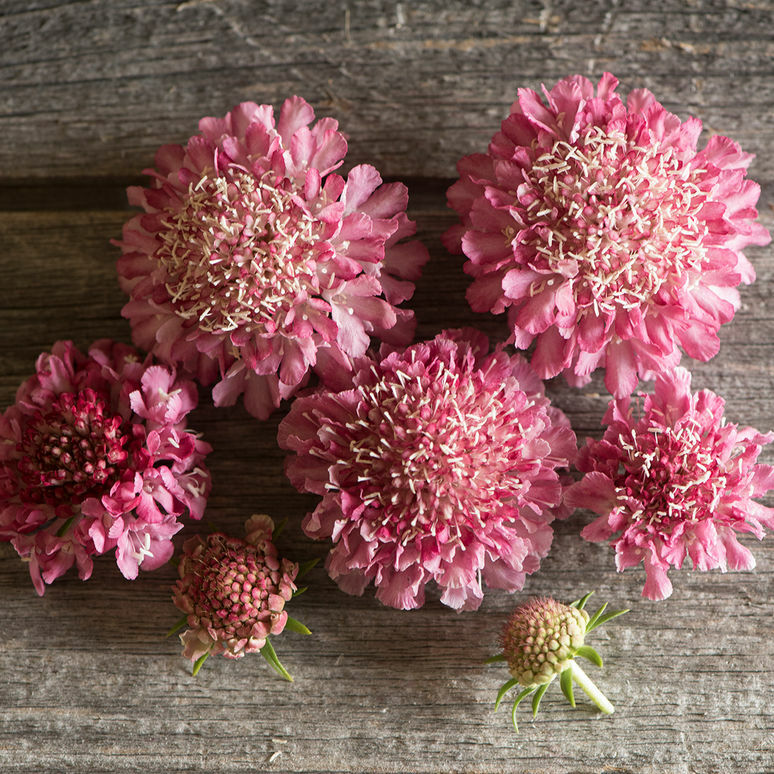 But with a few changes in your gardening practices, you can grow it all spring, summer, and fall without ever seeing it go to seed. The trick is to understand the life cycle of each vegetable or herb and how to best plant it to maximize it's harvest. With certain crops, like zucchini, it is best to understand how prolific they are and to plant them conservatively so that the entire garden (and thereby your diet and your neighbors' diet) is not taken over with just one thing. It is also helpful to plant things seasonally so that the harvest is not so overwhelming in August with little to eat before or after. Or sometimes we just want fresh salads all summer, but don't replant and are left salad-less after July 1st. Certain crops should be planted multiple times throughout the season to ensure a continuous harvest. This is called succession planting. How often you plant is a matter of taste and space and time. The following list describes the maximum you could do with each crop, but adjust according to your needs and priorities -- this is just a guide. If you want to make sure you have a certain vegetable all summer long, then you can follow the guidelines. If you want it a little less, then create your own modified planting schedule. 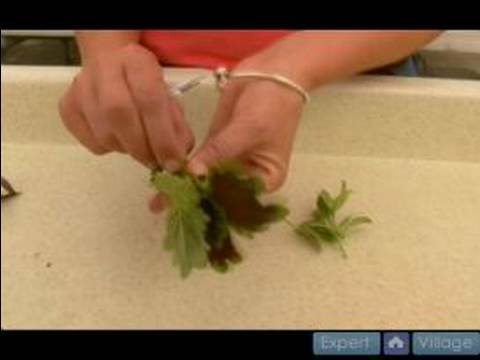 Lettuce can be grown from seed or from transplants. Seed grown lettuce is often grown in a row that can be cut and will re-grow a few times - think of mesclun. Transplanted lettuce can be grown to produce full heads like what you find in the store. Both methods require regular planting every week or two for a continuous harvest. It can be planted from seed in mid-April to mid-August for cut greens and transplanted for full heads from late April / early May through early August. Some people will transplant a few plants and plant some seeds at the same time in a different area; this method provides two generations of lettuce and two types of salad greens. 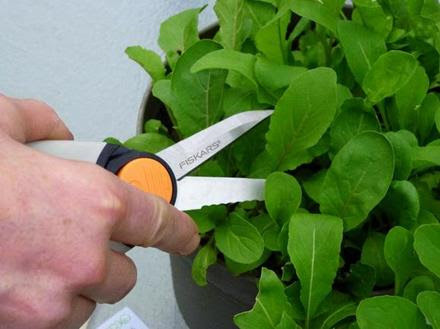 Once the cut lettuce becomes bitter in the heat of summer, it is best to pull it up, recondition the soil with compost, and plant something else. If the goal is to always have fresh lettuce, it is very simple to do if you remember to replant it. 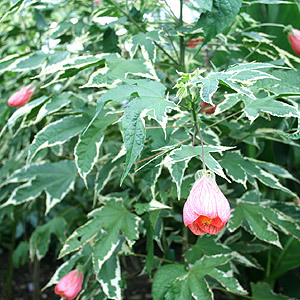 You can even purchase a number of plants and hold some in their pots in a shady spot and only plant out a few each week. You can seed it yourself in trays or pots and follow this same method. 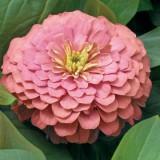 Having several varieties, cold-tolerant ones for spring and fall plantings, and heat-tolerant ones for mid-summer, will produce the best flavor. Cilantro is very similar to lettuce in its growing habits. It will grow up to a point and then goes to seed, called bolting. It will bolt more quickly in summer heat and, conversely, will stand ready to harvest for many weeks in the cool weather of fall--even early winter. It is good to time plantings so that cilantro is ready to harvest before June 21 (the solstice), and then plant more afterward. 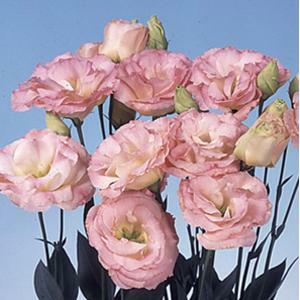 It can be transplanted or grown from seed. Like lettuce, it is simple to do both at the same time, thereby giving the gardener two generations. Cilantro seed is coriander, so it does have a use if you enjoy that flavor. There is nothing you can do to prevent cilantro from bolting entirely, but you can slow the process down by placing your mid-summer plantings in a partly-shady spot. Dill can be treated just like cilantro, and, like coriander seed, dill seed heads have a use in the kitchen, so it is fine to let some of the dill patch go to seed. The seed heads can be used in pickles. you can also let them self-sow or save the fully dried seeds in a paper bag for replanting. Basil can be planted multiple times for best results. 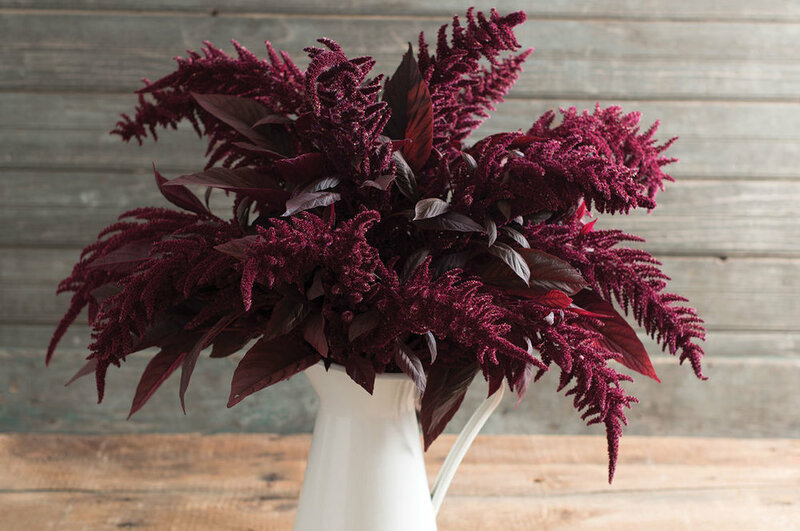 Plants can be pinched to slow down the flowering, but best flavor will come from newly replanted basil plants. This is a heat loving plant. Should only be planted once soil temps are in the upper 50's - usually last week in May or first week in June. Basil's flavor is at its peak right before it starts to make flowers. Cucumbers, cantaloupes, and zucchini and summer squash are best in quality when well tended. 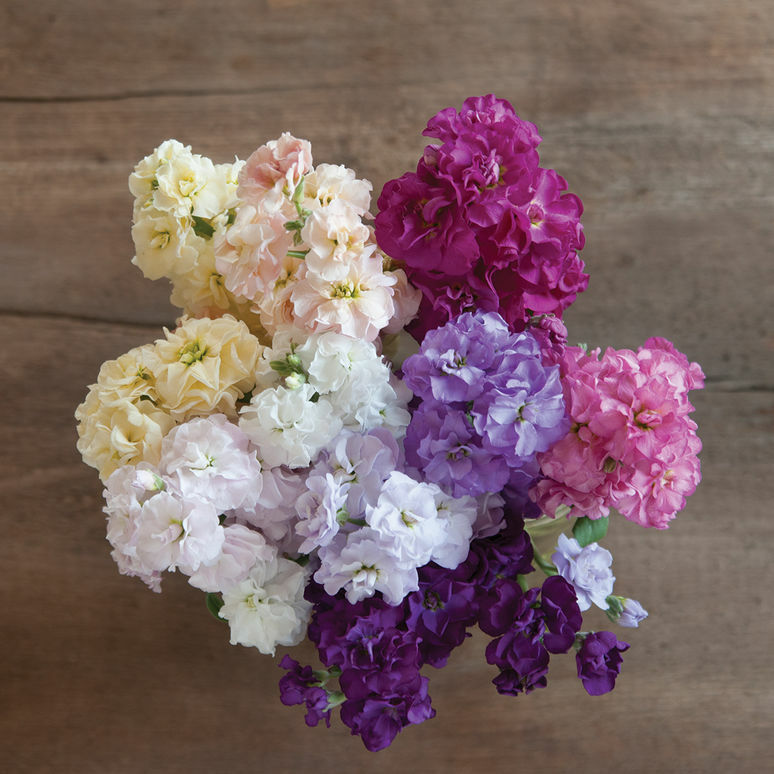 Just a single plant or two of any of those is usually enough for the home gardener, but by planting it two to three different times, the quality will always be good. The dates are: June 1st (or last week in May if you are in a warm spot), July 1st and July 15th. This method will ensure a continuous harvest of prime looking vegetables. Just remember to pull out and discard the pest- and disease- prone older plants. If your compost gets very hot and is well managed, it is okay to compost these plants. Pest problems will diminish when the older, less healthy plants are removed. Arugula, Cress, and other cutting greens for salads are best if sown or transplanted on a weekly or biweekly basis. Again, a small amount can be seeded next to the transplanted crops in order to give you 2 generations at once. This way you can have smaller quantities coming in at various times. Broccoli gives the gardener a couple of options. It is best if transplanted and can be planted 3 dates in the spring and 3 dates in late summer for a continuous harvest. I would choose late April, early May and mid May for the spring plantings and then Early August, mid August and early September for the fall plantings. Full heads can be harvested and the plants can stay in the ground to produce side shoots. Green Beans are best when fresh and young. The seed is relatively cheap, so it is better to rip out old plants and have new ones coming along regularly. Having smaller, multiple plantings also means that no on is stuck picking beans for hours on end. Sow new seeds when the previous or first generation is about 6 inches high. Boc Choi, Cabbage, Scallions, and Cauliflower can also be planted multiple times. Cabbage holds well in the heat and can be planted every couple of weeks late April through early August. Boc Choi and Cauliflower are not as heat tolerant and should be planted around the same dates as broccoli (see above). It is best to use row cover like Reemay on these young transplants so that flea beetles do not destroy the plants. Spinach is another one that does not do well in the heat, but can be planted multiple times in spring and late summer. It can also overwinter with a little straw mulch for very early spring eating. Frequency of planting can happen every week mid April to early June and then early August to mid September. The last plantings in September are the ones which will be over-wintered and eaten the following spring. Apply straw mulch on overwintering spinach in December once the ground is frozen. Beets, Carrots, Turnips can be planted every two or three weeks from mid-April until about the third week in July. Summer carrots are not the same as fall carrots and certain varieties do better in summer than in fall. The flavor of fall carrots is much sweeter, so I usually plant a larger patch in the fall. Fall carrots can also be stored all winter without going bad due to their lower moisture content. I don't love summer carrots, so I often skip those. Remember, it is all about what you like to eat. Celery and Celeriac are slower growing and can be planted 1 to 3 times during the season, from mid May until early July. These need lots of water and benefit from straw mulch to hold the moisture evenly around the roots. Bulb Fennel and radishes are similar to lettuce -- they can be planted each week if really loved, but they bolt in the heat and do best in the cooler temperatures of spring and fall. They are best if planted late April to early June and then again late August to mid September. 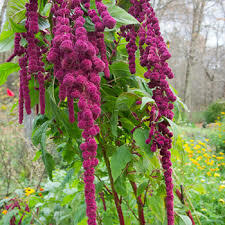 They are cold tolerant and hold well in late fall. Radishes are grown from seeds and fennel is best transplanted. Fennel also benefits from a straw mulch - even moisture around the roots is what helps it make larger roots. Corn -- it is possible to do multiple plantings over different weeks, but an easier method is to plant all at once, but with various varieties that have different days to maturity. There can be a 40 day span between early and late varieties. Peas can be planted every week, but this requires a lot of harvesting, irrigating, trellising, and variety research. It is possible though. 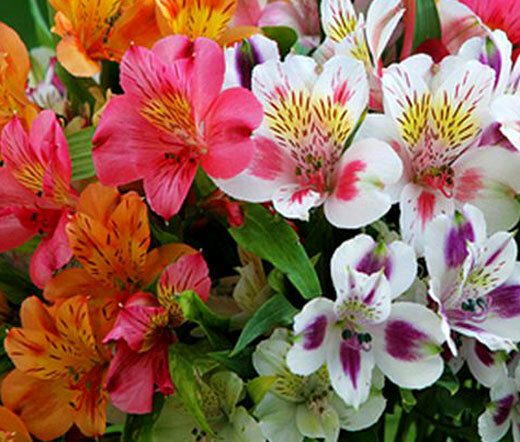 More practically, the home gardener can sow 2 or 3 varieties in late April with various days to maturity. Fall plantings are sometimes successful but are weather-dependent. These should be done in mid August. Tomatoes, Peppers, Eggplant -- try a few varieties of each in order to not have everything at once. Determinate tomatoes will provide you with a big harvest all at once which is a good thing for people who make big batches of sauce for canning or freezing. 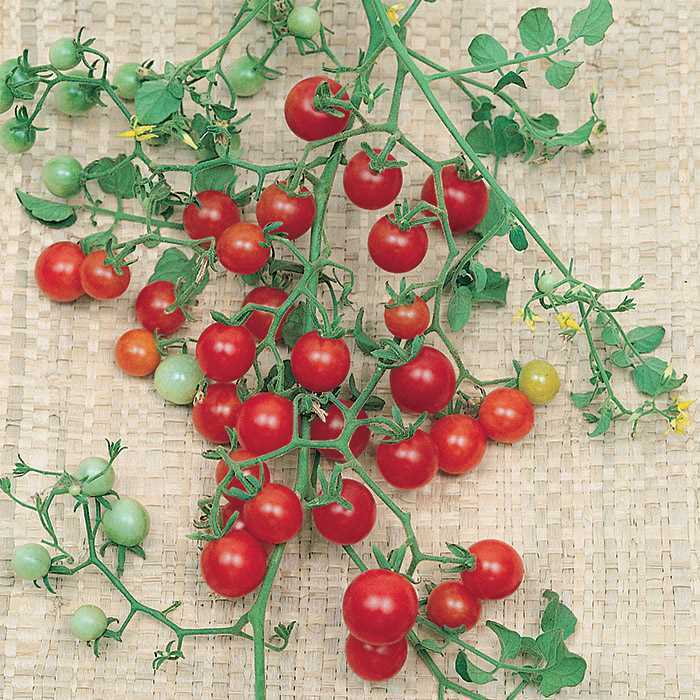 Determinate tomatoes are the ones that grow until a certain height and then mature all at once. Indeterminate tomatoes are the ones that grow indefinitely until the frost and the fruit ripens gradually August until frost or disease kills the plant. 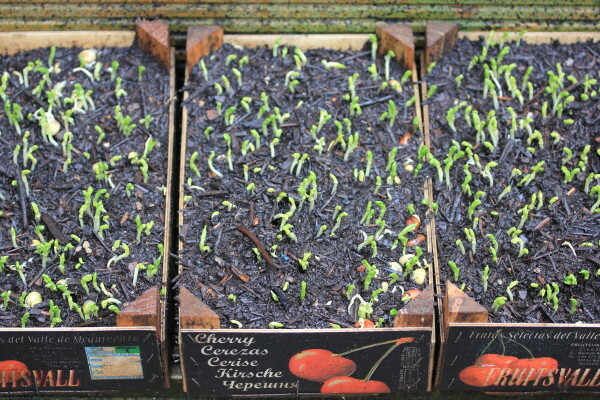 Peppers and eggplant are best if transplanted in early June once the soil warms up. One planting is usually plenty, but again an assortment of varieties will keep the harvest varied, staggered and interesting. Onions and Potatoes are generally planted all at once, and again a few different varieties will provide you with a longer period of fresh eating. Both onions and potatoes can be stored for long periods of time in cool and dark conditions. Both can also be eaten fresh as young, green onions or new potatoes. Both can be harvested, cured, and stored for eating year round, though some onion varieties store much longer than others. Winter Squash is another crop that is planted just once and can be stored. It is best cured for a week or two in a warm spot before eating. Fruit Spreads and Jams: I use a low- sugar pectin such as Ponoma's. It allows you to make a really simple fruit spread with honey or just a fraction of the sugar that would be in a regular jam. Canning: This is easiest to do with acidic foods such as tomatoes or fruit, otherwise, you will have to use a pressure canner. For a great explanation of canning, go to http://www.vegetablegardener.com/item/ 4516/introduction-to-canning. This will give you a very clear introduction to water bath canning (non-pressure canning of acidic foods). The ones that I do each year are tomatoes, peaches, and applesauce. Simple Tomato Sauce: Wash and cut up tomatoes into halves or quarters. Then pulse in food processor until they are chopped up well and the skins are pulverized. I usually do a few batches at a time until I have about a gallon of soupy tomato sauce which I then cook down for several hours over low heat until the desired thickness is reached. Salt to taste. This can then be canned or frozen. I doctor it up with herbs, garlic, etc when I use it in the winter time, which gives me more flexibility. Roasted Ratatouille: I chop up onions, zucchini, eggplant, and tomatoes and toss them with herbs, olive oil, and sea salt. I then spread it on cookie sheets in a single layer and roast in a 400 degree oven until soft and starting to caramelize (turning once or twice helps). It takes about 50 minutes per batch. I then freeze this in containers or freezer bags. It is fantastic on pizza, pasta, in lasagnas or other casseroles, or on its own. Sweet Peppers: Just chop up raw peppers and place in a freezer baggie. Very simple and a great addition to just about anything you are sauteing. Herbs: Any herb can be turned into a puree with a little olive oil and salt in the food processor. This is a good candidate for freezing in ice cube trays and then placing the frozen blocks into labelled baggies. When making dishes in the winter, simply toss an herb cube into the pot for extra flavor ; soups, sauces, stir fries, salad dressings are all good options for this method. Pesto can be frozen this way too, allowing you to thaw out just what you need. Other vegetables that freeze well are green beans and spinach: Just steam, dry well, and place in bags. Tomatoes can be frozen whole and raw--in the winter, when you use the tomatoes, you just have to run them under water to slip the skins off. Pickling beets, carrots and cucumbers is another simple and satisfying way to store these veggies. Beets and carrots should be boiled until just tender. Place the veggies into a jar with garlic, onion, dill seed, salt, pepper, hot pepper (optional), and mustard seed. Pour a boiling solution of 2 parts vinegar to 1 part water over the veggies, and seal. The heat of the boiling solution is enough to create a vacuum seal. Be sure to sterilize jars and lids first and to always use new lids. While not fully understood, compost tea is believed to be beneficial for several reasons. Fermentation creates a healthy community of fungi and bacteria, which may outcompete fungal disease and help support a plant’s natural defenses. It also contains nutrients, which can be absorbed through foliage. To make compost tea, mix one part mature compost that contains manure with five parts water. Allow the mixture to sit in a shady place for two weeks (it may become smelly!) Filter out large particles through cheesecloth, then spray on tops and bottoms of leaves every two weeks. The mixture will help reduce spreading of spores by infected plants, and can prevent infection of healthy plants. 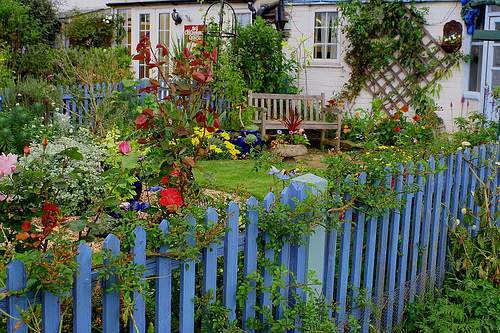 FAQ #25: How do I create a beautiful and functional garden fence? From Lily: Gardening has been a constant in my life for as long as I can remember. And with one constant seems to come another… Garden Critters. We all have our stories. The deer strolled though and ate the tops off all the baby beets. The woodchucks chomped cabbage heads in half. The neighbor’s horse got loose and stampeded the entire garden. Rascally raccoons destroyed the corn crop in the night. The squirrels had family feast in the blueberry bushes. Robins pulled out every bean sprout as they emerged from the earth. I’m all for sharing the harvest, but come on. This past spring was the last straw. I watched my own dog eat the asparagus shoots right out of the ground! It was time to build a fence. To install my own fence seemed like an unappealing and daunting project. I was intimidated. I like freedom, ease, and of course beauty in the veggie garden. Alas, I had to make moves. Precious asparagus was being robbed. There was no time to waste. Honestly, the dog was the main motivator. My biggest worry was that my quickie fence would be an eyesore. The final product has turned out to be nothing of the sort. My garden comrades and I made construction choices with installation time, simplicity, and expense in mind. We decided on very basic materials that were easy to procure. Cedar posts for the corners and the entrance; installed with a borrowed posthole digger. Wooden grade stakes as the perimeter; one every 5-ish feet, pounded in with a mallet. Coated wire fencing with small holes at the bottom to keep out little critters and large holes at the top which is eye pleasing. We paid a little extra for this but I’m glad because the design is truly easy on the eyes (visually I’m not a fan of chicken wire). A staple gun came in handy to attach the fencing to the grade stakes. Lastly, a very simple wooden frame was constructed with the fencing material as the gate. The fence has given the garden a sense of place and boundaries. It is no longer just a plot plowed out of the lawn. There is now a container to hold all the ideas, inspirations, and plans for the garden. In only a few hours we transformed the space! This year I hope to incorporate the fence more into the planting scheme of the garden by creating a narrow bed along the edge. The fence is a built in trellis. Why not plant annual climbing flowers! 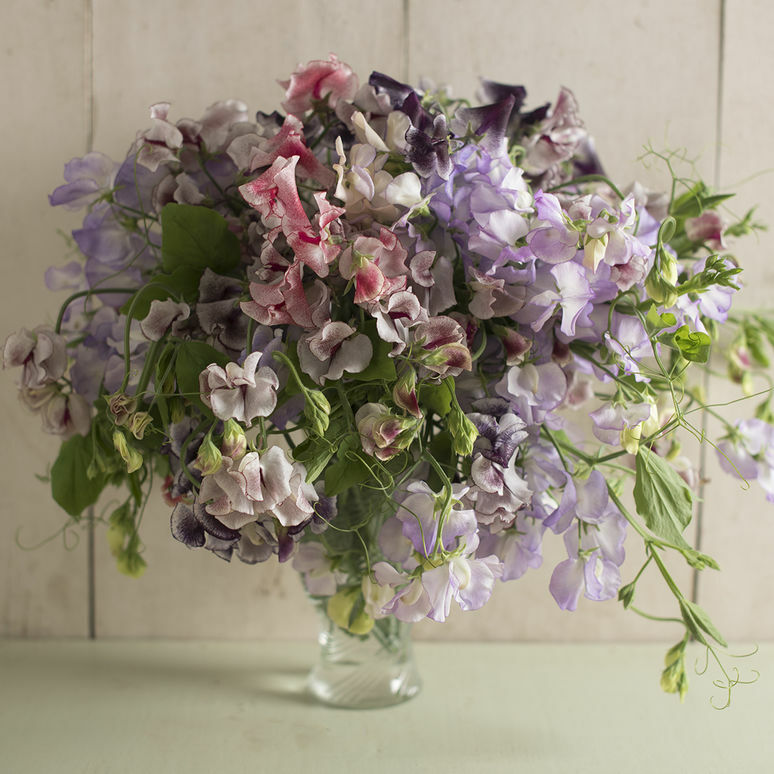 My favorites of course: Sweet peas, Cobaea, and Painted Lady Runner Beans. I’ve also been dreaming up a project to build a solid gate. 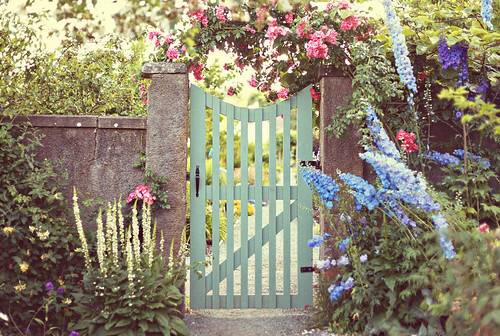 A gate that is structurally sound and provides an identity to the garden. Entrances hold an opportunity to set a scene, create a mood, transition from one thing to another. They are the first impressions of a space. When you pass through a gate or doorway you have the chance to leave behind what you don’t need: a chance to step into the present. FAQ #9: What is sheet mulching and how do I do it? Trample or cut down any large woody weeds. Put down a layer of compost to jump-start the composting process. Create a thick weed-barrier of newspaper, cardboard, or other biodegradable materials over the area you want to convert, wetting with a hose as you go. Cover the weed-barrier with weed-free compost or composted manure at least 3 inches thick. The top layer mimics the materials that fall to forest floor - nut shells, twigs, fern fronds, coffee grounds, wood chips, etc. are all good materials. Create a layer 3-5 inches thick and water in. FAQ #18: How do I make compost? Make some kind of container about 3’ in diameter, such as a length of chicken wire or 4 pallets hitched together to make a square. Put a layer of sticks on the bottom, just thrown in to allow air to flow into the pile. Add a variety of plant material, in layers if you can, but it’s not really necessary. You need some brown material, such as leaves, and some green material, like freshly pulled weeds, grass clippings or kitchen scraps. Top with a few handfuls of manure, if you have it, or half-done compost. This isn’t necessary, but speeds up the process. Sprinkle with water so the pile feels like a damp sponge. Don’t soak it, it needs air. The pile should heat up. When it stops, turn it. A compost aerator makes turning the pile an easy matter, so I do it more often, but you can also use a shovel or garden fork. Having two compost piles makes it easier to use the finished compost, since one can be allowed to finish while you’re adding to the other. Use the finished compost on your garden. 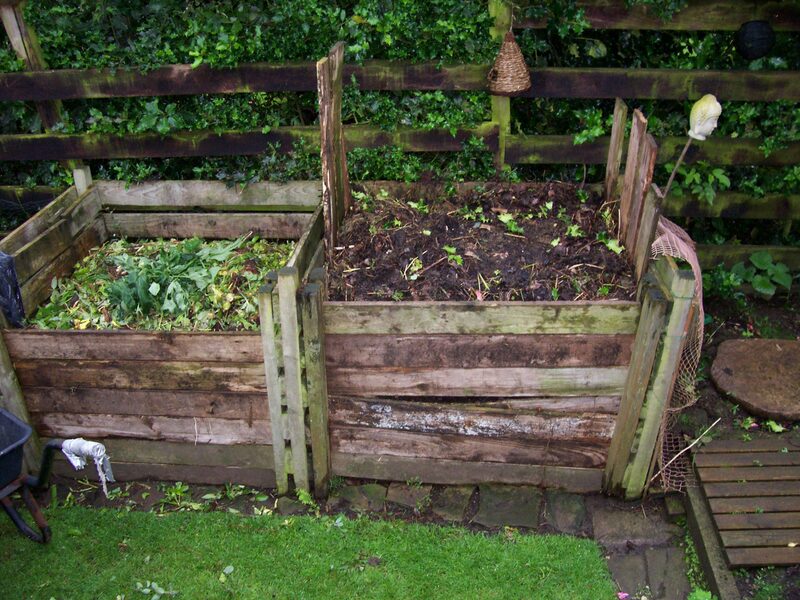 Even if it’s not be finely screened compost, it will finish decomposing in the soil. FAQ #15: Should I mulch my flower beds? How much time do you want to spend weeding? If you love to weed as I do, you don’t need to mulch. However, mulching will save 80% of weeding time, so most people are happier with a mulched garden. Use a fairly thin layer (2-3 inches) and put a thinner layer on in subsequent years. Mulching also conserves water. Make sure the soil is moist before mulching because the mulch sometimes inhibits moisture from getting to the roots. FAQ #14: How can I keep my garden looking good without spending all my time weeding? First of all, gardens need some maintenance, so if you want a nice looking garden, you will need to commit some time to caring for it. Bark or straw mulch helps to keep down weeds and makes those that do grow easier to pull up. One good way is to edge with a shovel then use a hand cultivator to pull away the grass that is “cut off”. Edging makes weeding easier and makes the garden look really nice when you are done. When pressed for time, I edge, then weed in about 12 to 18 inches. 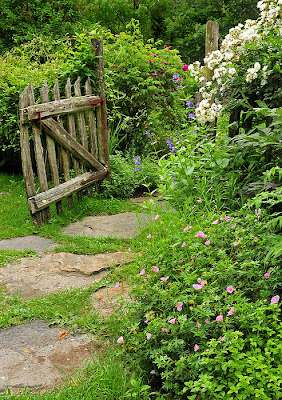 If your garden is full, the weeds in the middle won’t even show and you give an impression of a well-maintained space. Planting ground covers such as mosses, alyssum, and vinca will reduce the space that weeds can take over. You can check out a video on edging with a shovel here.